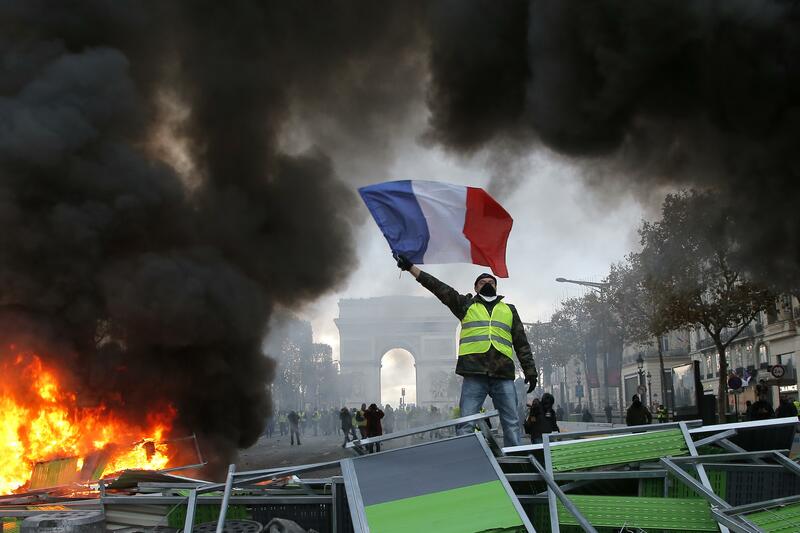 Sat., Nov. 24, 2018, 7:54 p.m.
PARIS – French police fired tear gas and water cannons to disperse violent demonstrators in Paris on Saturday, as thousands gathered in the capital and beyond and staged road blockades to vent anger against rising fuel taxes. Thousands of police were deployed nationwide to contain the eighth day of deadly demonstrations that started as protests against tax but morphed into a rebuke of President Emmanuel Macron and the perceived elitism of France’s ruling class. Two people have been killed since Nov. 17 in protest-related tragedies. Tense clashes on the Champs-Elysees that ended by dusk Saturday saw police face off with demonstrators who burned plywood, wielded placards reading “Death to Taxes” and upturned a large vehicle. At least 19 people, including four police officers, were slightly hurt and one person had more serious injuries in the day of unrest in Paris, according to police. Police said that dozens of protesters were detained for “throwing projectiles,” among other acts. By nightfall the Champs-Elysees was smoldering and in the Place de la Madeleine, burned scooters lay on the sidewalk like blackened shells. “It’s going to trigger a civil war and me, like most other citizens, we’re all ready,” said Benjamin Vrignaud, a 21-year-old protester from Chartres. “They take everything from us. They steal everything from us,” said 21-year-old Laura Cordonnier. The famed avenue was speckled with plumes of smoke and neon – owing to the color of the vests the self-styled “yellow jacket” protesters don. French drivers are required to keep neon security vests in their vehicles. Interior Minister Christophe Castaner said that 8,000 protesters flooded the Champs-Elysees at the demonstration’s peak and there were nearly 106,000 protesters and 130 arrests in total nationwide. Castaner denounced protesters from the far-right whom he called “rebellious,” as he accused National Assembly leader Marine Le Pen of encouraging them. But the Interior Ministry played down the scale of Saturday’s demonstrations by highlighting that up to 280,000 people took part in last Saturday’s protest. The unrest is proving a major challenge for embattled Macron, who’s suffering in the polls. The leader, who swept to power only last year, is the focus of rage for the “yellow jacket” demonstrators who accuse the pro-business centrist of elitism and indifference to the struggles of ordinary French. Macron has so far held strong and insisted the fuel tax rises are a necessary pain to reduce France’s dependence on fossil fuels and fund renewable energy investments – a cornerstone of his reforms of the nation. He will defend fresh plans to make the “energy transition” easier next week. Paris deployed some 3,000 security forces on Saturday, notably around tourist-frequented areas, after an unauthorized attempt last week to march on the presidential Elysee Palace. Police officials said that a no-go zone, set up around key areas including the presidential palace and the National Assembly on the Left Bank of the Seine River, has not been breached. But authorities are struggling because the movement has no clear leader and has attracted a motley group of people with broadly varying demands. The anger is mainly over a hike in the diesel fuel tax, which has gone up seven euro cents per liter (nearly 30 U.S. cents per gallon) and will keep climbing in coming years, according to Transport Minister Elisabeth Borne. The tax on gasoline is also to increase four euro cents. Gasoline currently costs about 1.64 euros a liter in Paris ($7.06 a gallon), slightly more than diesel. Published: Nov. 24, 2018, 7:54 p.m.